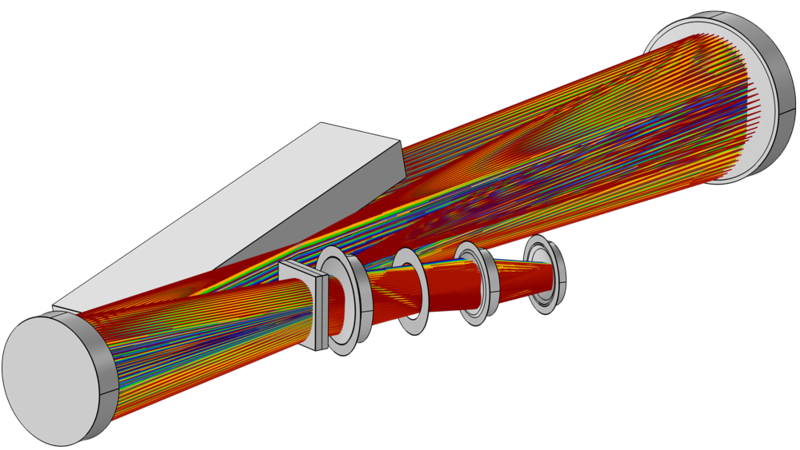 The Ray Optics Module is an add-on to the COMSOL Multiphysics® software that allows you to model electromagnetic wave propagation with a ray tracing approach. The propagating waves are treated as rays that can be reflected, refracted, or absorbed at boundaries in the model geometry. This treatment of electromagnetic radiation uses approximations that are appropriate when the geometry is large compared to the wavelength. 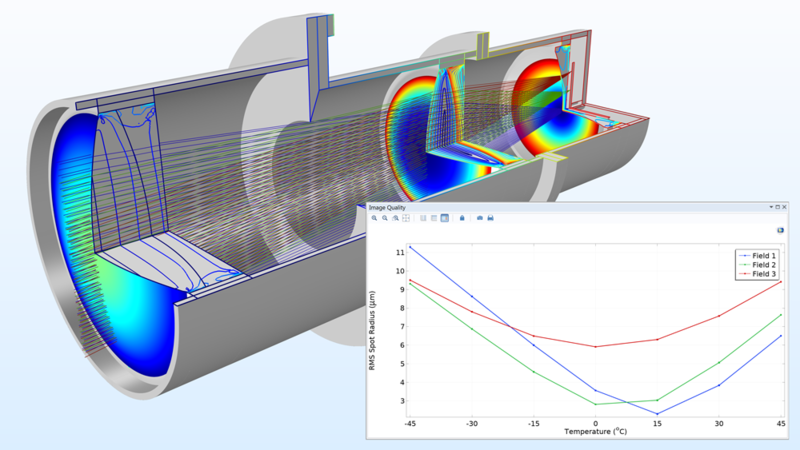 Combining the Ray Optics Module with other modules from the COMSOL® product suite enables ray tracing in temperature gradients and deformed geometries, allowing for high-fidelity structural-thermal-optical performance (STOP) analysis within a single simulation environment. 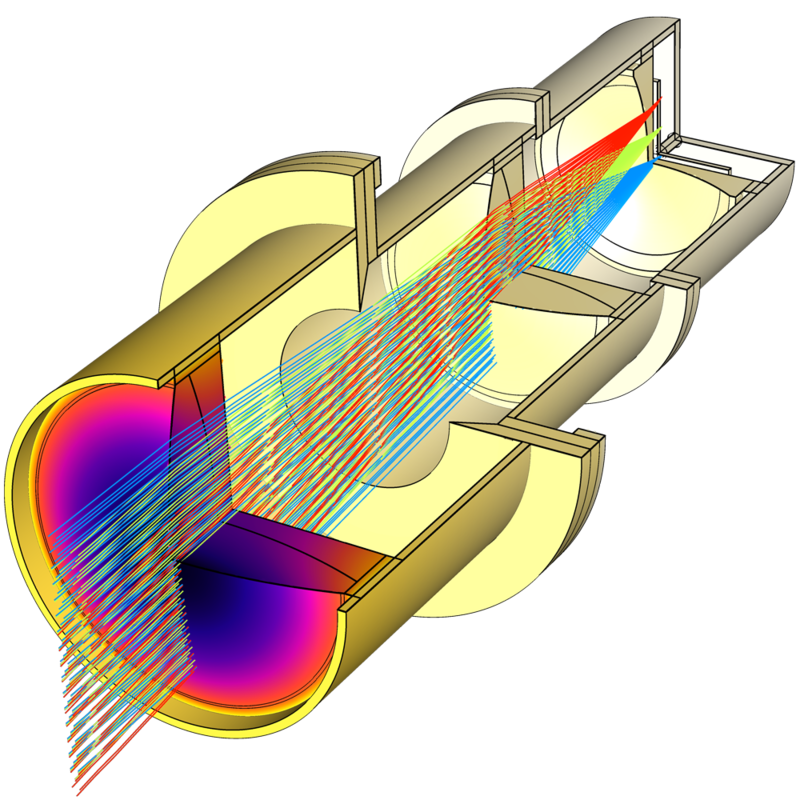 The Ray Optics Module provides tools for specialized ray optics modeling when combined with the core functionality of the COMSOL Multiphysics® software platform. 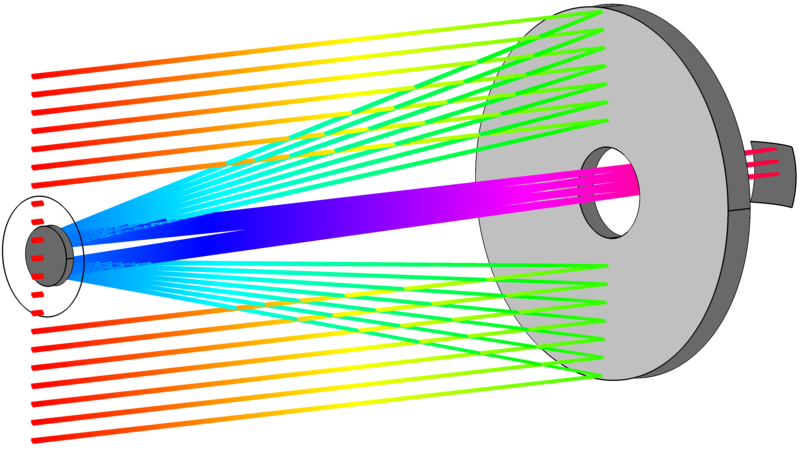 A ray diagram for a Petzval lens system. The rays are colored by their path along the lens axis. 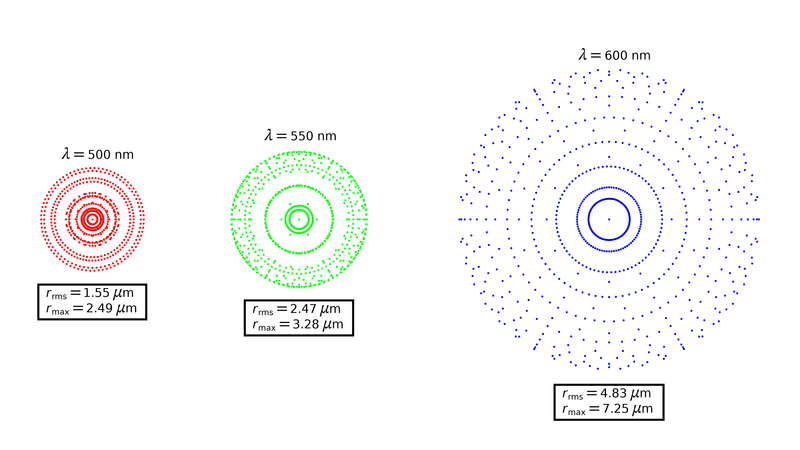 Three spot diagrams are shown for three different values of the vacuum wavelength in a Petzval lens system. The RMS ray radial position and maximum relative ray radial position of all released rays are shown beneath each diagram. Thermally induced focal shift in a high-power laser focusing system. 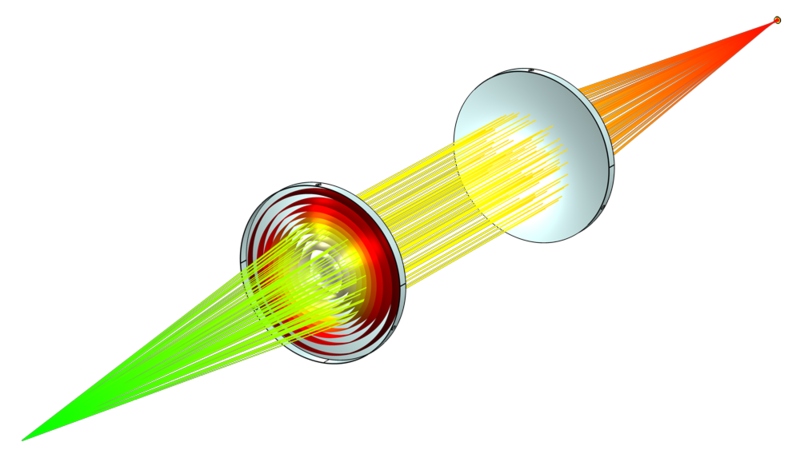 This model demonstrates the two-way coupling in which optical perturbations result from heat generated by ray attenuation in the lenses. When the Vdara® hotel first opened in Las Vegas, the reflective curved surface of the hotel caused sunlight to be focused near the pool at certain times of the day and year. (This has since been fixed.) This model shows how to visualize the caustic surfaces that intersect the poolside. Plot of reflectance vs. wavelength for a distributed Bragg reflector, or dielectric mirror. A parametric sweep is used to show how increasing the number of layers causes the reflectance to approach 100% within the stopband. Polarization ellipses of light propagating through two linear polarizers and a quarter-wave retarder. The ray diagram for a double Gauss lens system. The rays are colored by their path along the lens axis. Explore the features and functionality of the Ray Optics Module in more detail by expanding the sections below. The Ray Optics Module includes a library of essential geometry parts, including mirrors, lenses, prisms, and aperture stops. Each of these parts is fully parameterized, and many of them include variants with different combinations of input parameters so they can be conveniently modified to fit an optical design. For example, you can insert a spherical or conic mirror into the geometry sequence; specify whether the surface is concave or convex; enter its radius of curvature; and then specify the clear diameter, full diameter, and diameter of the flat (if any). These inputs can be adjusted manually or by running a Parametric Sweep study. Additionally, the parts can be oriented with respect to previously inserted parts using built-in work planes, and the parts can automatically create named selections to easily assign boundary conditions to the correct surfaces. 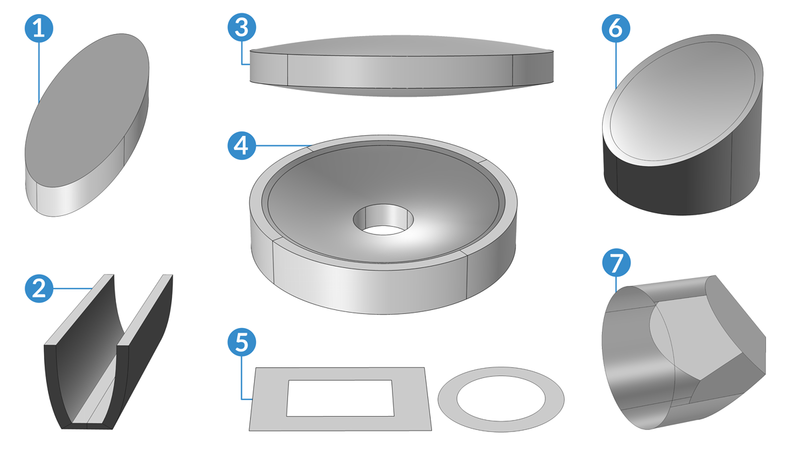 The Part Library for the Ray Optics Module includes a wide variety of geometry parts, including: elliptical planar mirror (1), compound parabolic concentrator (2), spherical lens (3), spherical mirror (4), rectangular and circular aperture stops (5), off-axis conic mirror (6), and corner cube retroreflector (7). 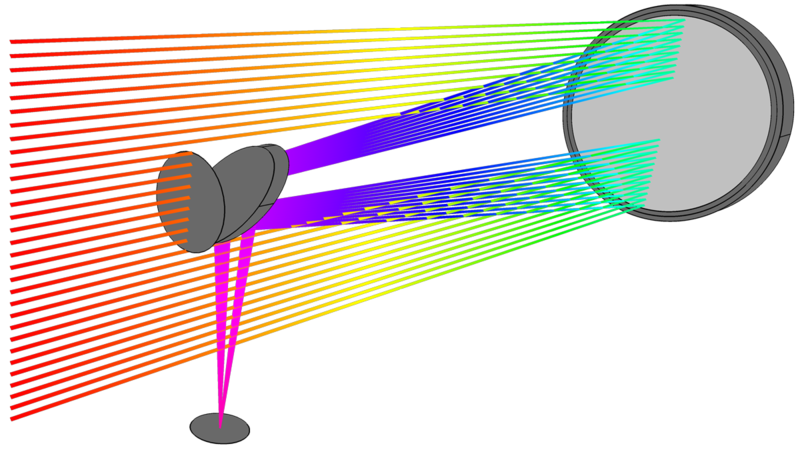 Rays in a Newtonian telescope featuring a spherical primary mirror and flat elliptical secondary mirror. Rays in the Hubble Space Telescope, which uses a standard Ritchey-Chrétien geometry consisting of two on-axis conic mirrors. The refractive index of each medium can be specified directly or derived from an optical dispersion relation. The dispersion coefficients, such as Sellmeier coefficients, can be loaded from a material database or entered directly into a user-defined material. The refractive index can be complex, wherein the real part determines the speed of light in the medium, while the imaginary part causes ray attenuation or gain. Thermo-optic dispersion coefficients are also available to adjust the refractive index based on temperature. There is also a temperature-dependent Sellmeier dispersion model that combines the temperature and wavelength dependence into a single set of Sellmeier coefficients, which is especially useful for cryogenic materials. 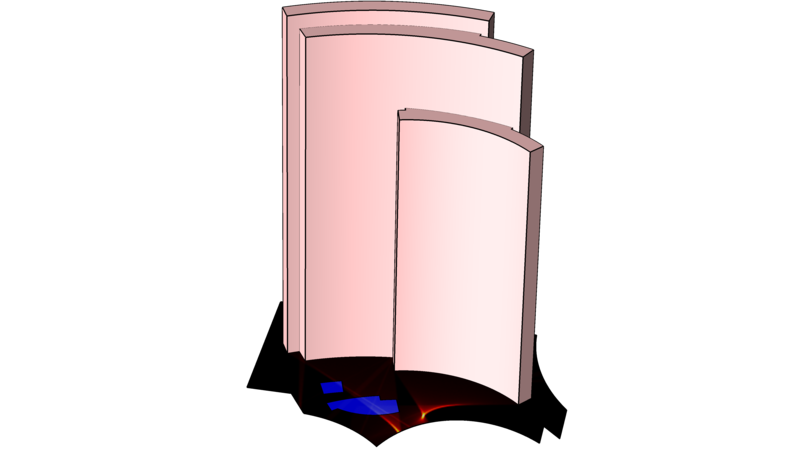 A double Gauss lens system shown as a 2D slice. 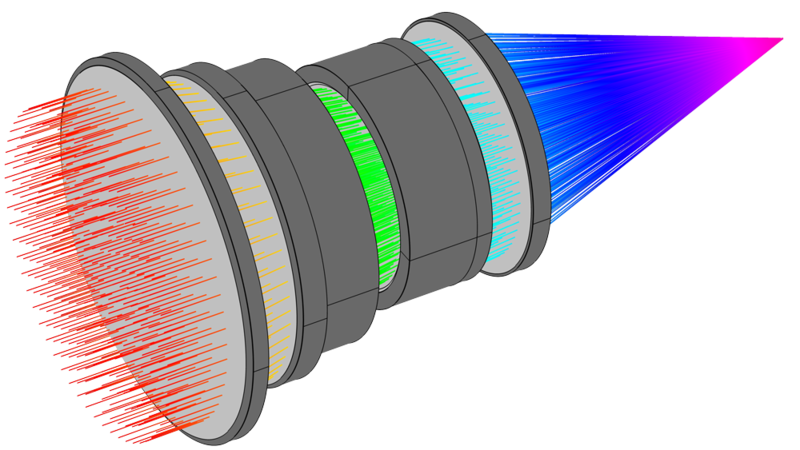 The six lenses are made of three different glasses (shown in blue, green, and red) that have different optical dispersion coefficients. Rays automatically detect geometry boundaries in their path without the need to specify the order of ray-boundary interactions. When a ray reaches a surface, it can be diffusely or specularly reflected, refracted, or absorbed. You can also assign conditional boundary interactions or randomly choose between two different boundary interactions with a given probability. At boundaries between dielectric media, each incident ray is deterministically split into reflected and refracted rays. Total internal reflection is also detected automatically. If the ray intensity is solved for, it is automatically updated for the reflected and refracted rays according to the Fresnel equations. You can also define thin dielectric layers on material discontinuities, which can be used as filters, antireflective coatings, or dielectric mirrors. 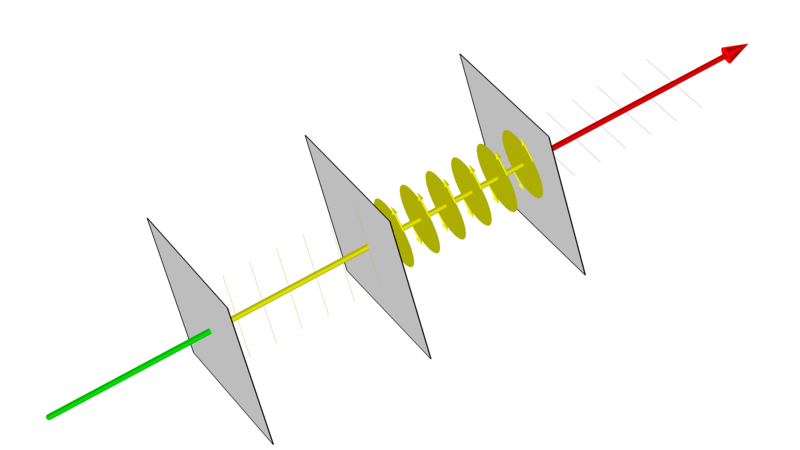 A white pupil Échelle spectrograph is modeled by employing two mirrors, two diffraction gratings, and a Petzval lens system, combined to sort rays into a 2D array of points according to their wavelength. Rays can be initialized by entering their coordinates directly, importing the coordinates from a text file, or releasing rays from selected geometric entities. Rays can be released from any selection of domains, boundaries, edges, or points in the geometry. There are also dedicated features to produce solar radiation at a specified location on Earth's surface or to release reflected or refracted rays from an illuminated boundary. When solving for the ray intensity, it can be initialized either by using an expression or loading a photometric data file (specifically an IES file) into the model. At each release position, the rays can be launched in a user-specified direction, or a number of different directions can be sampled from a spherical, hemispherical, conical, or Lambertian distribution. Ray trajectories and deposited power in the focal plane for a solar dish receiver system under ideal conditions (left) and real conditions (right), accounting for surface roughness and solar limb darkening. The rays can propagate through both homogeneous and graded-index (GRIN) media. They can also be monochromatic or polychromatic, where you can specify a distribution of wavelengths or enter a set of discrete values. To solve for additional quantities along the ray paths, the Geometrical Optics interface includes built-in handling of ray intensity and polarization. The intensity calculation uses a form of Stokes–Mueller calculus that makes it easy to keep track of fully polarized, unpolarized, and partially polarized rays. 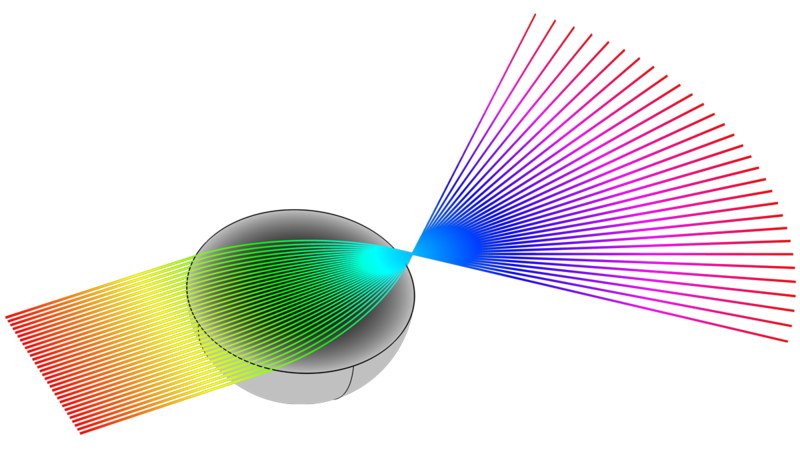 A collimated incident beam is focused to a point on the other side of this Luneburg lens, a type of spherically symmetric graded-index (GRIN) lens. With the COMSOL Multiphysics® postprocessing tools, you have the ability to create both visually pleasing and informative simulation results. You can plot rays as lines, tubes, points, and vectors in 2D or 3D, and color the rays by an arbitrary expression that can vary between different rays and even along each ray's path. When solving for ray intensity, you can also plot polarization ellipses along the rays. COMSOL Multiphysics® also provides the flexibility to show more than just ray paths, with other dedicated plots to view interference fringes and to decompose optical path difference into individual monochromatic aberration terms. You can also plot the intersection points of rays with a plane, sphere, hemisphere, or a more specialized surface. Ray diagram of a spectrometer in a crossed Czerny–Turner configuration with rays colored by wavelength (left) and a 1D plot of the spectral resolution as a function of wavelength (right). 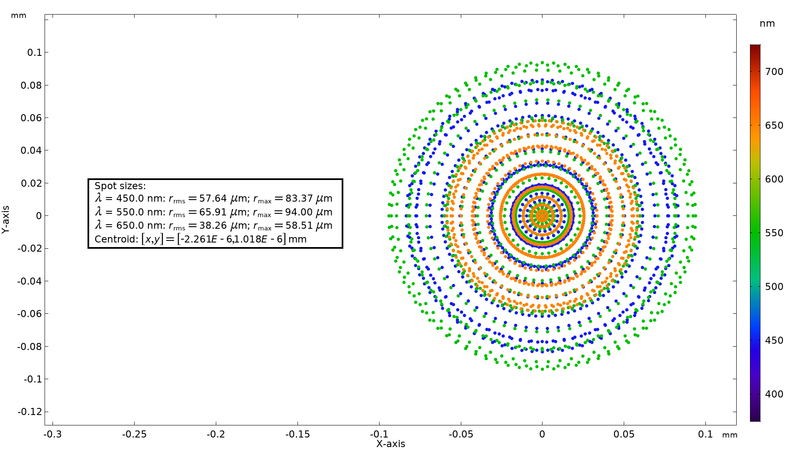 Stability analysis of a laser cavity in a symmetric bowtie configuration. In the 1D plot, the results of the ray trace are compared to the cavity stability predicted by ABCD matrix theory. The ray diagram shows a stable configuration (a parameter value for which the stability is 1 because the ray remains trapped. 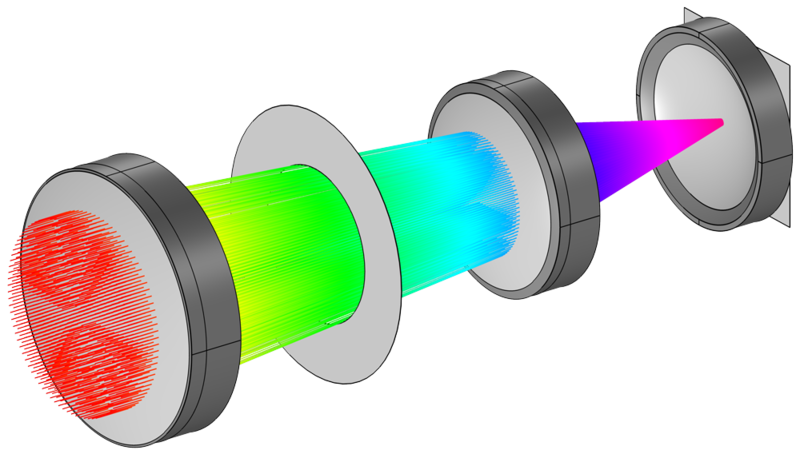 After building a ray optics model, there are a host of further opportunities available with the Application Builder that further simplify the simulation workflow. For instance, you can restrict the inputs and control the outputs of your model, parameterize the model geometry, and provide templated report generation. You can use simulation applications to run your own tests more quickly or distribute applications to other members of your team to run their own tests, further freeing up your time and resources for other projects. Expand the capabilities of simulation throughout your team, organization, classroom, or customer base by building and using simulation applications. The solar dish receiver model, turned into a simulation application, is more accessible for designing solar dish receivers without knowing the background physics. Optical systems can be extremely sensitive to changes in their environment, especially when operating under extreme conditions such as underwater and outer space. You can create high-fidelity optical simulations using the COMSOL Multiphysics® software and the specialized add-on Ray Optics Module. The most obvious environmental factor is temperature, since the refractive indices of most materials follow some form of thermo-optic dispersion relation. Physical deformations in the optical system, either due to thermal stress or other applied loads, can also significantly affect the image quality. You can conveniently account for all of these multiphysics phenomena in a single integrated modeling environment, making it easy to conduct coupled structural-thermal-optical performance (STOP) analyses. You can also combine the Ray Optics Module with other add-on modules that offer expanded structural and thermal modeling capability — for example, to account for thermal radiation, conjugate heat transfer, hyperelastic materials, and piezoelectricity. Vdara is a registered trademarks of CityCenter Land, LLC. 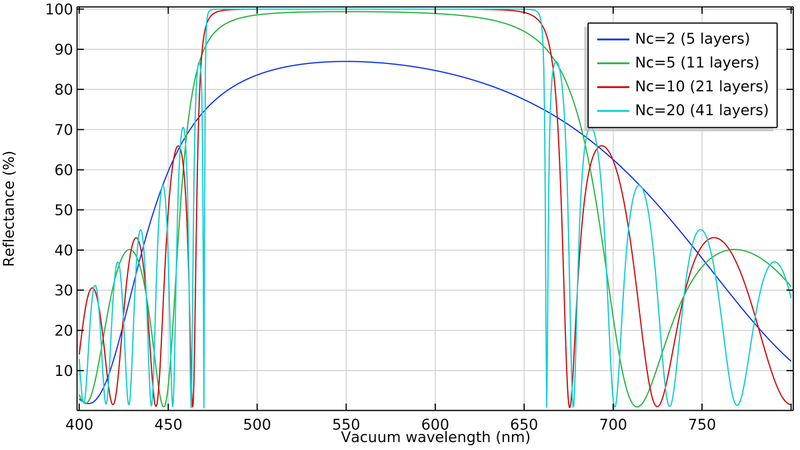 Structural-thermal-optical performance (STOP) analysis of a Petzval lens system enclosed in a vacuum chamber. Rays at three different field angles are shown.